color, and origination of the Black Crown; and how the mantra “Karmapa Khyenno” arose. In the morning, the Gyalwang Karmapa discussed key elements of his tradition as a preparation for explaining the practice in the afternoon. Beforehand, however, he made some important points about doing the practice. People can listen to the explanation, but in order to do the actual practice, they must have received an empowerment in the highest yoga tradition (anuttara yoga). He also counseled that if we know Tibetan, it is best to chant the text in Tibetan, which is available in a pecha format. For the most part, the words of the practice belong to the Eighth Karmapa, Mikyö Dorje and a few are those of his students who compiled the text. The Karmapa divided his talk among several sections: the history of the Karma Kamtsang lineage; how the name Karmapa came about; the meaning and origination of the Black Crown; and how the mantra “Karmapa Khyenno” arose. 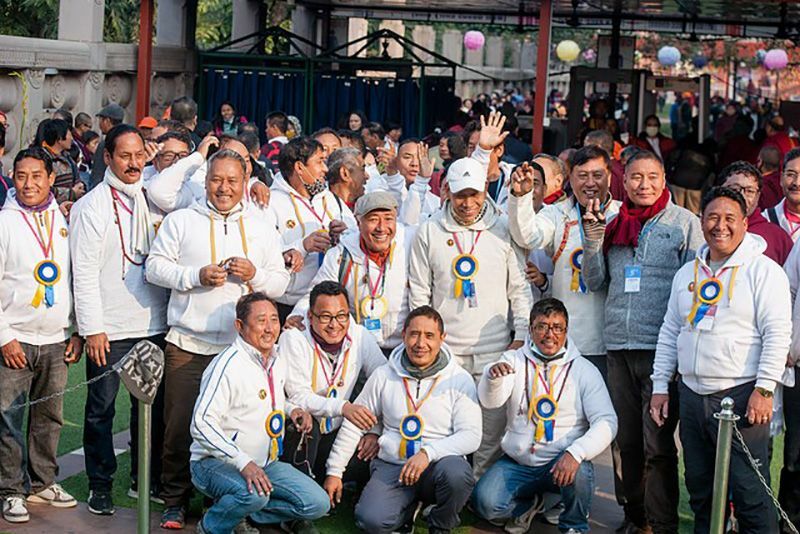 For the first, the Karmapa explained that Gampopa had numerous students and among them, four were lineage holders, known as the founders of the four earlier lineages of the Dakpo Kagyu tradition: Barom, Phakdru, Kamtsang, and Tsalpa Kagyu. From Phakmo Drupa stemmed the eight later lineages: Drikung, Taklung, Trophu, Lingre, Martsang, Yelpa, Yasang, and Shuksep Kagyu. Contemporary scholars state that the term “the four earlier and eight later lineages” came from Jamgön Kongtrul Lodrö Thaye (1813-1899). However, in the seventeenth and eighteenth centuries, there lived a master named Taklung Ngakwang Namgyal who composed a famous history of the Taklung lineage. This contains a tea offering mentioning the four earlier and eight later lineages that descended from Gampopa. Further, the Fourth Kamtrul Rinpoche, Chökyi Nyima (1730-1779), wrote in his autobiography about the four elder lineages. These two texts, therefore, both predate Jamgön Kongtrul and indicate earlier sources for the term. In general, the Karmapa commented, there are two ways to understand the four elder and eight younger lineages: they can refer to the Kagyu lineages in general or only to the Karma Kamtsang, as explained in Karmay Khenchen Rinchen Dargye’s commentary on the Short Vajradhara Lineage Prayer. Here, he states that they refer to four and eight disciples of the First Karmapa, Dusum Khyenpa. The present Karmapa emphasized that the Tibetan words che and chung, which are usually translated as “greater” and “lesser,” should actually be translated as “earlier” and “later,” as it is not a question of which lineage is better but of historical precedence. To support his position, the Karmapa referred to the stories of Gesar of Ling, in which the lineages stemming from his three brothers, the older, middle, and younger, are called the greater, middling, and lesser in terms of their seniority. Here it is a question of age, not of greatness, similar to the four earlier and the eight later Kagyu lineages. The Karmapa then addressed the topic of the name Kamtsang Kagyu. Usually, he said, it is considered a synonym for Karma Kagyu but actually, there is a slight difference. The Kamtsang Kagyu arose from Dusum Khyenpa who was a direct disciple of Gampopa, and founder of one of the four elder lineages. It seems that the name Kamtsang arose earlier than the Karma Kagyu, as the first part of the name Kam is taken from Kampo Nenang, the place where the First Karmapa stayed in retreat and where he realized mahamudra. Of the three main seats he founded that were related to his body, speech, and mind, this is the place of his body. Tsang literally means “nest” or by extension, “isolated place,” so Dusum Khyenpa nested at the remote Kampo Nenang just like a bird. The next question was how did the Karmapa receive his name? 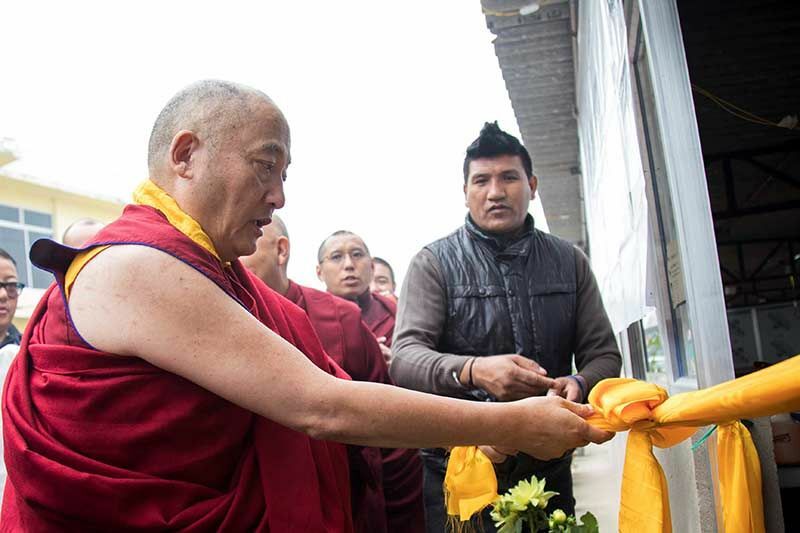 In some Tibetan histories, the Karmapa remarked, it is said that the First Karmapa, Dusum Khyenpa, was given this name because he founded a monastery called Karma Khading. However, the Third Karmapa, Rangjung Dorje, wrote in his versified autobiography that this monastery was not founded until his time, so the attribution to the First Karmapa is incorrect. Pawo Tsuklak Trengba (1504-1566) mentions in his history of Dharma, A Feast for Scholars,(and it is mentioned in other histories as well) that when Dusum Khyenpa was ordained at the age of sixteen, he had a pure vision of all the buddhas and bodhisattvas bestowing on him the Black Crown and enthroning him with the name Karmapa, the one who performs the activities of all the buddhas. In general, the Karmapa observed that a member of the ordained sangha may have have many names—the name before ordination and afterwards, the secret name given upon entering a certain mandala, even a name the people in general gave them. The Karmapa thought it was reasonable to say that Karmapa was one of the many names of Dusum Khyenpa. It was not well known but kept secret since it was bestowed in a pure vision. On the other hand, the Second Karmapa, Karma Pakshi, was famous as the Karmapa, so the secret name of the previous incarnation had became the public name of the subsequent one. This happened with several Karmapas; for example, the secret name of the Second Karmapa, Karma Pakshi, was Rangjung Dorje, and this was the public name of the Third Karmapa, Rangjung Dorje. This custom has confused many people. The colophon of the text called the Cycle of Infinite Oceans,(which included An Infinite Ocean of Philosophical Schools, An Infinite Ocean of Validity, An Infinite Ocean of Questions and Responses, and so forth), states that it is written by Rangjung Dorje. Many thought that this meant the third Karmapa, however, it was actually referring to one of the many secret names of Karma Pakshi, which then became the public name of the Third Karmapa. Similarly, Rölpay Dorje is a secret name of the Third Karmapa, and it became the public name of the Fourth Karmapa, Rölpay Dorje. We know that this is a secret name of the Third Karmapa because in a line from his text the Profound Inner Principles, he mentions, “look this up in my text the Appearance of the Light of Mandalas.” This is a rare composition of his that the present Karmapa received recently. Its colophon states that it was written by Rangjung Rölpay Dorje, confirming this as one of the Third Karmapa’s names. The Karmapa summarized that during the time of the First Karmapa, Dusum Khyenpa, only a few people knew that he carried the name Karmapa, but the Second Karmapa himself often said, “I am the one famous as the Karmapa.” So this is one proof. Another proof the Karmapa mentioned to illustrate that the secret name of the previous Karmapa becomes the public name of the subsequent one is that in his Great Commentary on the Yoga Tantra, the Eighth Karmapa, Mikyö Dorje, wrote that the great masters of sutra and tantra are Butön (Rinchen Drup 1290-1364) and Rangjung Dorje. Mikyö Dorje explained that this latter name refers to the Second Karmapa (Karma Pakshi with a secret name of Rangjung Dorje) and the third holder of the Black Crown Rangjung Dorje. There are many other historical sources, the Karmapa commented, but no time to discuss them here. The next topic related to the Karmapa as the bearer of the Black Crown, which has been present from the time of the First Karmapa, Dusum Khyenpa. In his autobiography, Karma Pakshi speaks of a crown of black silk that no one had ever seen before. Also Dharma histories, such as the Feast for Scholars, recount that the Black Crown probably dates from the time that Dusum Khyenpa was in retreat at Kampo Nenang. Here he had a vision of Saraha wearing a black hat, which became the model for one that Dusum Khyenpa created. The Karmapa then talked about the color of the crown. In Tibetan it is called zhwa nag po, literally “Black Crown,” but actually its real color is blue-black (mthing nag). The Karmapa referred to the empowerment of Chakrasamvara that he had recently given, and within its vase initiation, there is the crown empowerment. 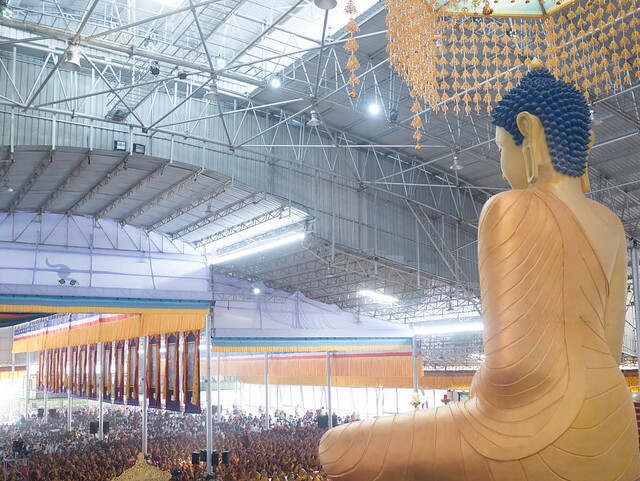 Here, each of the buddhas of the five families has a crown the color of his body: Akshobhya’s crown is deep blue or blue-black, Ratnasambhava’s is yellow-gold, and Vairocana’s is white. 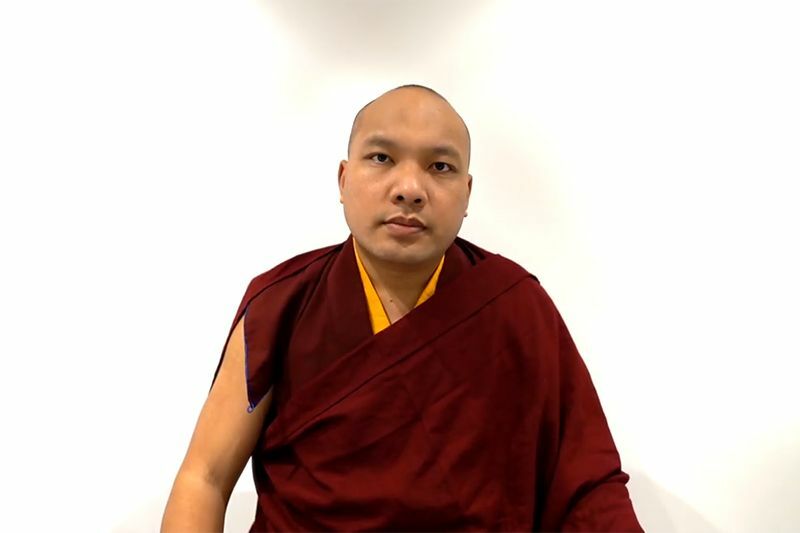 The Karmapa wears a blue-black crown to indicate that he is the vajra mind of all the buddhas and that he belongs to the vajra family of Akshobhya. Further, many of the Karmapas have “Dorje” as part of their name: Rangjung Dorje, Rigpe Dorje, and so forth (a total of ten out of seventeen Karmapas). It was only later, the Karmapa remarked, that the emperors of China, in particular those of the Ming dynasty, offered the Karmapa a jeweled Black Crown; the original Black Crown, however, goes all the way back to the First Karmapa, Dusum Khyenpa. Another question concerns the origin of the ceremony for displaying the Black Crown. It is difficult to say, however, when it actually began. The earliest historical source we have, the Karmapa observed, is of the Eighth Karmapa, Mikyö Dorje (1507-1554) giving a Black Crown ceremony. There are two Black Crowns: one named Dzamling Yezhwa was offered to the Sixth Karmapa Thongwa Donden, by a Ming emperor, and the other is called Meaningful to Behold (mthong ba don ldan), but its origin is not clear. The Karmapa then turned to discuss the source of his name mantra, Karmapa Khyenno. History records that at the invitation of the Emperor Yongle, the Fifth Karmapa (1384-1415) traveled to the Chinese capital of Nanjing. From this period dates a deep connection between the Secret Mantra tradition of Tibet and the Chinese people. After this time, the Karmapa explained, a book was composed in different scripts (Tibetan, Chinese, Lantsa, and so forth) that gave the images and names of buddhas, bodhisattvas, and yidam deities of the Secret Mantrayana along with their name mantras. The page of the Fifth Karmapa has his image with his name below and off to the side is the mantra Om Mani Padme Hung, not his name mantra Karmapa Khyenno. Since the Karmapa is considered an emanation of Avalokiteshvara, the Karmapa commented, it is not surprising to find the six-syllable mantra associated with him. 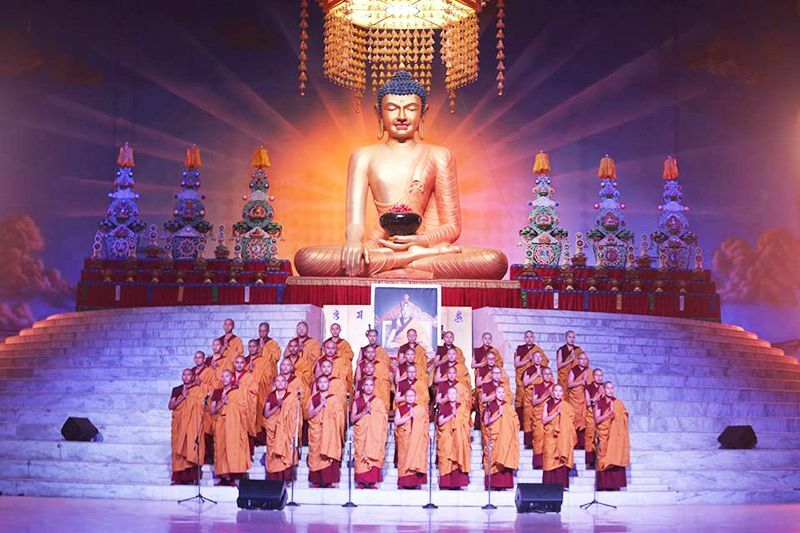 There was also a tradition of people (known as maniwa, the mani people) putting the mantra to a melody and singing it to benefit others as they traveled around Tibet. This custom dates from the time of the Second Karmapa, as does the tradition of mani wheels. This is confirmed, the Karmapa stated, in a history by the sixth or seventh Benchen Lama, in which he discussed the benefits of mani wheels and traced them back to Karma Pakshi. 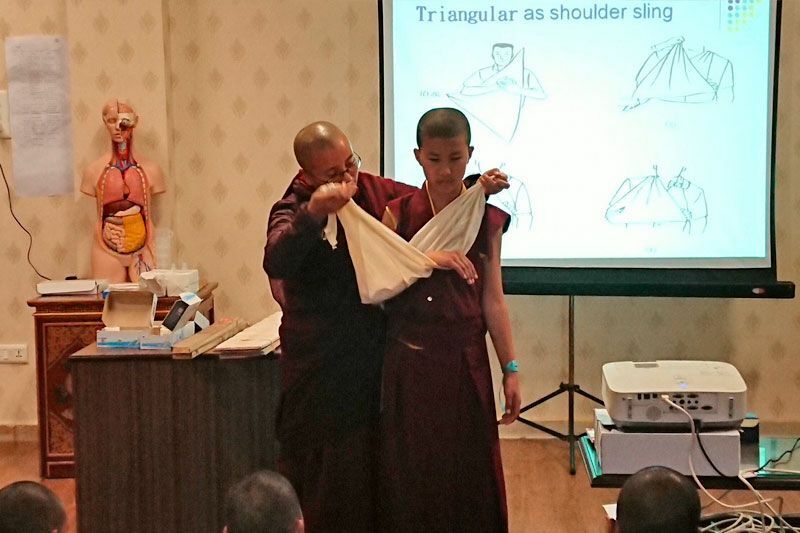 So there is a special connection between the Karmapas and the six-syllable mantra. So then how did the name mantra Karmapa Khyenno come about? It is difficult to say that it was begun by one specific person. There is a Tibetan tradition, which predates the arrival of Buddhism, in which people would call out to their deities, asking for protection: “Khyenno!” (Think of me!) “Zigso!” (Look at me!) People would ask their deity to protect them, Lha Khyenno, (Deity know me!) This somewhat resembles the English expression “My God!” and one would be hard pressed to say exactly from whom or when this came about. Likewise, it seems that Karmapa Khyenno surfaced in a natural way from the Tibetan people. They said the words and as their wishes were accomplished, slowly the phrase transformed into a mantra with the power of true words. This completed the introduction to the Karmapa’s lineage, detailing what is special to it, and in the afternoon he will explain the visualizations for the practice of the Four-Session Guru Yoga.